This is a Mass Effect Andromeda skills page on the Barricade skill. 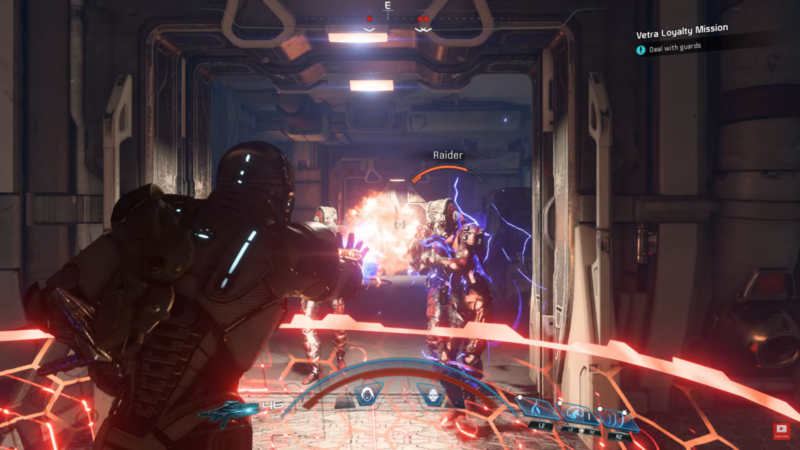 Here you’ll find information about the plethora of dangerous skills used in Mass Effect Andromeda. This skill deploys a temporary energy barricade, boosting shield regeneration for everyone taking cover. Other combat bonuses apply per upgrade. 1 Power cell is required. Barricade 1 1 Deploys a temporary energy barricade that will boost shield regeneration for everyone who takes cover behind it. Upgraded versions provide additional combat bonuses for allies. Activation requires one power cell from Barricade’s limited power cell supply. Weapon Feedback 5 5 Increases weapon damage and accuracy by 15% for all allies (including the user) behind the barricade. Power Feedback 5 5 Increases power damage and force by 20% for all allies (including the user) behind the barricade. Regeneration 6 6 Negates broken shield regeneration delay for allies (including the user) behind the barricade. Electric Defense 6 6 The barricade electrocutes nearby enemies with a chance to stun them. Especially damaging to shields and synthetic foes. Affected enemies are primed for combo detonations. This ability is best used against groups of enemies near a choke point, like a door way or a small hall way. The barricade, combined with your team, functions as a blockade, and your team will be able to take out the foes immediately.